Mr. N.R. Narayana Murthy(Born August 20, 1946) is an Indian industrialist, software engineer and one of the seven founders of Infosys Technologies, a global consulting and IT services company based in India. Born into a Kannada Madhva Brahmin family in Mysore, India on August 20, 1946, Murthy graduated with a degree in electrical engineering from the National Institute of Engineering, University of Mysore in 1967 after attending government school, and received his master's degree from IIT Kanpur in 1969. After IIM Ahmedabad, he then joined Patni Computer Systems in Pune. Before moving to Mumbai, Murthy met his wife Sudha Murthy in Pune who at the time was an engineer working at Tata Engineering and Locomotive Co. Ltd. (Telco, now known as Tata Motors) in Pune. In 1981, he founded Infosys with six other software professionals. He served as president of the National Association of Software and Service Companies, India from 1992 to 1994. Mr. Murthy is the brother-in-law of serial entrepreneur Gururaj "Desh" Deshpande and the uncle of former NASSCOM Chairman and MphasiS chief Jerry Rao. Murthy served as the founder CEO of Infosys for twenty years, and was succeeded by co-founder Nandan Nilekani in March 2002. He is the chairman of the governing body of the International Institute of Information Technology - Bangalore, and was the Chairman of the Governing Body of the Indian Institute of Management, Ahmedabad. 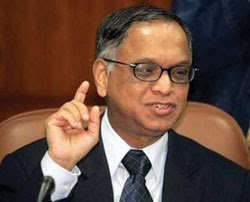 Padma Shri and Padma Vibhushan are the awards won by Narayana Murthy.